Why is the elimination of property taxes so difficult? Earlier this month Lieutenant Governor John Fetterman visited Pottsville as part of his listening tour regarding the legalization of recreational marijuana. Following his visit I created a legislative survey to see where people in the 29th district stand on this issue. The results are in and we received 741 total responses. 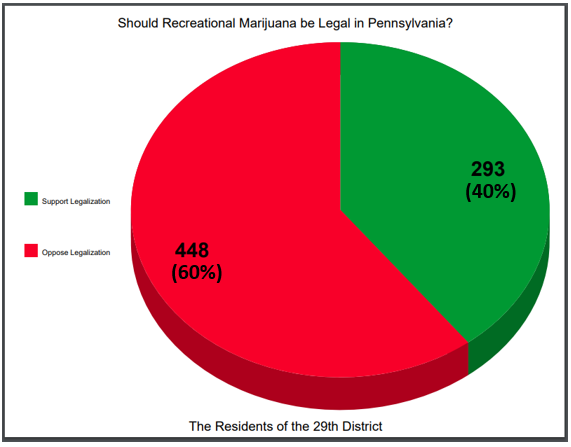 As you can see in the chart below of those response 60% of residents oppose legalization of recreational marijuana while 40% support its legalization. I’d like to thank everyone who participated in this survey. I will be conducting more polls in the future to discuss a wide variety of issues that the Pennsylvania Senate will be grappling with this session. A question I am often asked by constituents is why can’t we pass Senate Bill 76? This issue seems like a no brainer for those struggling to stay in their homes due to this archaic tax. Unfortunately, not everyone feels this way about Property Tax Elimination. This article outlines five things that stand in the way of property tax elimination. This article includes a detailed explanation of the obstacles ahead as I continue our bipartisan effort against this unfair system. I will continue working with my colleagues and the more than 80 grassroots groups who crafted Senate Bill 76 to create a better and fairer way to fund our schools. Here is the list of the 17 Senators who have cosponsored the bill with me this session. We need to continue to build on this number to attain the 26 Senators that we need, as well as 102 Representatives and the signature of the Governor. 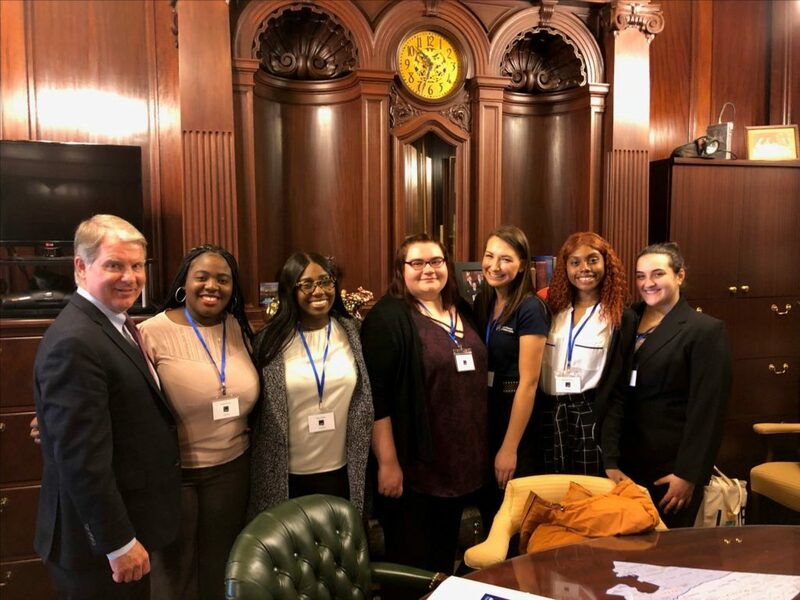 I had the opportunity to meet with several students, faculty, and alumni of Penn State University who live in the 29th district. We had an interesting conversation on school funding, the importance of higher education, the legislative process and how it pertains to the state budget. Penn State Capital Day occurs once a year and is the single largest advocacy event the University holds. It is sponsored by Advocate Penn State and the Office of Government and Community Relations and provides a good opportunity for meaningful conversation on school funding and the budgetary process in state government. Thank you for stopping by and I’m looking forward to seeing you next year! I, along with my colleagues Senator Aument and Senator Regan, circulated a co-sponsorship memo for legislation to provide an increase in the staffing at the Inspector General’s office to increase the number of investigations they can do to combat welfare fraud. After the first year, the department would report the number of cases they address, how much money was saved, and how many tips/cases were left unaddressed. Last year, the Inspector General’s Office conducted an investigation of 26, 656 applications which saved the state of $75.2 million in welfare benefits that would have been incorrectly paid! This legislation is an effort to ensure that people are not abusing the system and to ensure that our tax dollars are not being wasted on fraudulent cases. The Pennsylvania Department of Transportation (PennDOT) announced that a team of students from the North Schuylkill High School has been selected as the PennDOT District 5 winner for its second Innovations Challenge. Congratulations! The team was mentored by Kelly Stone, team members include: Drew Mashack and Tyler Wolfgang. Since last fall, students have been working hard to solve this year’s challenge which asked students to look at innovative methods, aside from laws and educational campaigns, that can be developed in the next five to 10 years to get drivers to slow down in work zones. The PennDOT Innovations Challenge invites high school students in grades 9-12 to use their problem-solving abilities to tackle real-world transportation challenges. Regional winners will now move on to compete in Harrisburg on April 10 for the state championship. The statewide winning team will be awarded $1,500 from the Pennsylvania Chapter of the American Traffic Safety Services Association (ATSSA) to be divided among team members. 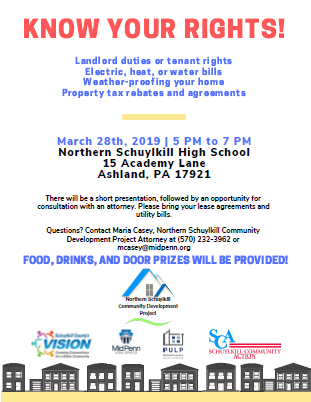 You are invited to attend a presentation on March 28th at Northern Schuylkill High School to learn more about your rights as a landlord or tenant. There will be a presentation and an opportunity to have a consultation with an attorney if you have any questions or concerns. To get the most out of this event please bring your lease agreements and utility bills.